A nun was in confession with her Mother Superior and they were discussing swearing and bad language. “I used some horrible language this week and feel absolutely terrible about it”, the nun said. “When did you use this awful language?” asks the Mother Superior. 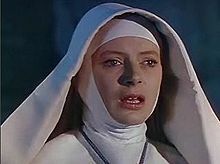 The nun replied, “Well, I was out playing golf, and I hit an incredible drive that looked like it was going to go over 280 yards. However, the golf ball struck a phone line that was hanging over the fairway and then fell straight down to the ground after going only about 100 yards”. “Is that when you swore?”, the Mother Superior asked. “No, Mother,” said the nun. “After that, a squirrel ran out of the bushes, grabbed my ball in its mouth and began to run away”. “Is THAT when you swore?” asked the Mother Superior again. “Is THAT when you swore?” asked the now amazed Mother Superior. “No, not yet”, the nun replied. “You see, as the eagle carried the squirrel away in its claws, it flew near the green and then the squirrel dropped my ball”. “Did you swear THEN?” asked Mother Superior, becoming impatient. “No”, the nun said, “because the ball fell on a big rock, bounced over the sand trap, rolled onto the green, and then stopped about six inches from the hole”.